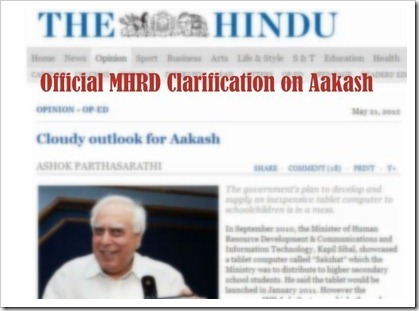 Editor’s Note: After reading Mr. Ashok Parthasarathi’s article regarding Aakash Tablet in The Hindu – Cloudy outlook for Aakash – we got in touch with officials in MHRD requesting them for clarification on the same. Following was their official response to the article. I presume, this response was sent to “The Hindu” (see last line) earlier, however, they seem to have not given it enough importance and have not published it in their publication. The article by Mr. Ashok Parthasarathi in The Hindu (page 11) dated 21st May 2012 is replete with inaccuracies and statements which are totally at variance with the facts. 1. Repeatedly, Mr. Parthasarathi mentions the Aakash device in the context of school students ( "which the Ministry was to distribute to higher secondary school students"). This is incorrect. Aakash has been sanctioned as a project under the National Mission on Education through ICT (NME-ICT), meant for students in Higher Education domain. 2. The article talks about some fictitious tender "However the company, HCL Info Systems, which, through a tender floated by the Ministry, had won the contract to source and distribute the computers initially, backed out." The Ministry is not aware of any such tender. The Ministry has till date not floated any tenders for the LCAD. Hence, there is no question of HCL having "won the contract" and then later backing out. 3. At another place in the write-up, reference is made to some tender which apparently the Ministry "floated" and which was "bagged" by Datawind. To reiterate, the Ministry has till date not floated any tenders for the LCAD. IIT Rajasthan proposed a project under NME-ICT for the procurement and testing of the Aakash device. This proposal was accepted by the Mission following its norms and funds were transferred for this project to IIT Rajasthan, who then floated the tender. 5. The Ministry was not involved with the process of tendering and awarding of contract was done by IIT Rajasthan. Hence, to say that "The Ministry then ordered one lakh "Aakash" tablets from DWL" is patently incorrect. 6. IIT Rajasthan awarded the contract to Datawind after an open tender process. Datawind selected Quad Electronics as their contract manufacturer. Neither the Ministry nor IIT Rajasthan had any role in this selection by Datawind as it was purely an internal affair of Datawind. Therefore, Mr. Parthasarthy’s comment about selection of Quad "through an unknown methodology" is better directed at Datawind. 7. Datawind has the design house and it could have got the product assembled anywhere in the world so as to meet the stringent price points. It was due to the desire to bring in Indian assemblers and to promote them vis a vis Chinese or Taiwanese assembly houses that Datawind roped in Quad Electronics of Hyderabad for assembling 50,000 of the 100,000 Aakash tablets that it had contracted to supply. Obviously, the private contract between Datawind and Quad Electronics cannot be termed as arising out of some unknown methodology ! 8. The writer mentions several figures throughout the article—"Quad produced only 20,000", "DWL lifted only 10,000", "DWL-HRD provided 2,000 to IIT Rajasthan" etc. It is unclear from what source or sources the author has got these wildly inaccurate numbers. Also, to whom or what is he referring to when he talks about "DWL-HRD" ? 9. He talks about delivery to IIT Rajasthan being made a week before the launch. This information too, like most of the article, is incorrect. The article says "Mr. Sibal went ahead with his pre-determined launch – that is, despite knowing the severe poor performance of "Aakash" as evaluated by the very institution that designed and developed it, viz. IIT Rajasthan " This passage too, if full of inaccuracies. The date of launch was determined well in advance. IIT Rajasthan, which had been given the task of procuring and testing the LCAD brought in for the launch those devices that had passed their tests. Once again, IIT Rajasthan did not design or develop the Aakash LCAD. They were responsible for just procuring and testing it. 10. IIT Rajasthan had not prescribed any testing criteria at the time of placing the order. Since any new product undergoes a number of testings and trials for its improvement, Aakash coming out of the production lines of Quad Electronics also went through a number of iterations for its improvement. 11. Manufacturing a tablet at 1/10th the prevailing market price of other brands, in itself, was a great achievement. The rejects were on various issues such as freezing, heating, replaceable screen flaps coming loose after a few hours of operation etc. The devices selected were after rigorous 100% testing of the devices supplied. Out of 6440 tablets supplied to IIT Rajasthan, all except 600 were returned by IIT Rajasthan to Datawind for rectification of defects and then returning the devices to IIT Rajasthan, as was envisaged in the agreement between IIT Rajasthan and Datawind. 12. The article says, "500 schoolchildren were made to buy dud "Aakash" tablets at a subsidized price". The fact is that not a single child was made to buy "Aakash" tablet, leave alone 500 schoolchildren as the author claims. The device was distributed free of cost to 500 students of higher education (for whom this device is meant). The device was given to these students for purposes of testing and to obtain feedback on the device so that improvements could be made for going forward. Hence, there was no "total wastage…. of Rs. 3.75 lacs" as stated in the article. 13. The author refers to "serious material accounting aspect" , once again based on figures which are incorrect and for which the author alone knows the source. 14. The author refers to a dispute between Datawind and it’s contract manufacturer Quad. The Ministry has nothing to do with the commercial dealings between Datawind and Quad. 15. The article states, "This messy dispute has brought the supply of "Aakash" to schoolchildren – its avowed objective – to a complete halt". To set the record straight, the dispute between Datawind and it’s manufacturer has not brought deliveries to a complete halt as claimed by the author. Also, it is reiterated that Aakash tablet is meant for distribution to students of higher education and not school children as the author mistakenly believes and keeps repeating. 17. The writer himself mixes up two different statements of the Minister of HRD, and then blames the Minister for "confused and inconsistent statements". Mr. Sibal clarified in Parliament that the project now stands transferred from IIT Rajasthan to IIT Bombay. At the World IT Forum, Mr. Sibal referred to the plans for the next version of Aakash for which the tender has not yet been floated. There is no contradiction in what the Minister has told the Parliament and what he has told in the World IT Forum 2012. There are two parallel tracks progressing in this field. One is receiving supplies of 100,000 pieces of improved Aakash tablets at the same price for evaluation, testing, field trials and teacher empowerment. The other parallel track is for moving ahead with even better specifications with more indigenization and more IPs from our institutions and leveraging the high volumes for bringing the tablet design and manufacturing eco-system to India. Obviously the devices would be named Aakash-3 or its higher versions. 18. What is not understood by the writer is that, as part of the Ministry’s endeavour to rectify the initial shortcomings in Aakash, the supply of 100,000 Aakash at older specifications was converted to supply of 100,000 Aakash of higher specifications at the same price. This itself is another milestone. Now, instead of getting 100,000 Aakash tablets with 366 MHz ARM 11 processor, 2100 mAH battery and resistive touch panel, the 100,000 Aakash tablets will be supplied with a 700 MHz ARM Cortex A8 processor, 3200 mAH battery and Capacitive touch panel. Any one who knows anything about technology would agree that the enhanced specifications are indeed a quantum jump over the earlier specifications and retaining the price of Rs. 2276 per piece, it is like a dream come true. Obviously, the quality has to be ensured and that is why the agreement talks of free replacement warranty for 1 year at supplier cost. It is this improved version of Aakash, called Aakash-2, which has already started rolling out of the production lines and will be launched soon. 19. The writer asks, "How much money was paid by the Ministry to DWL for the supply of "Aakash 1"?" IIT Rajasthan has informed the Ministry that till date no payments have been made to Datawind. 20. When IIT Rajasthan has neither developed any technology nor supplied any to Datawind, the question of leveraging the knowledge and using it for creation of Ubislate does not arise. The idea of creating such a low cost tablet and various experimentations to bring that idea to fruition do belong to MHRD and are enshrined in the Mission Document. The technology itself relies on various components which are already available in the market. It is a question of putting them together, integrating them and making the system work as per the desired specifications through a printed circuit board layout. Many companies are manufacturing tablets in the world – Apple, Samsung, etc. And each one has a unique PCB design. PCB designs have been made by all the companies who compete in the tender and it is not a very great innovation. What is most important is procuring quality components at low enough prices to be able to keep the overall cost of the tablet within the prescribed range (around USD 35/-). Obviously, development of sources of supply for various components such as processors, lcd panel, touch screen, batteries, memory etc. (each one is covered by its individual Intellectual Property Right) and vendor development would remain the domain of the supplier. If Indian PSUs get into it, it is they who would develop it. It is here that the eco-system development for Aakash-3 becomes important and that has immense potential in terms of usage and volumes. It is re-iterated that deliveries of Aakash-2 would commence in the month of May, 2012, as soon as green signal is given to the supplier after testing the initial pieces of Aakash-2 and that assurances given by the Minister of Human Resource Development would be respected in toto. It is disquieting that an article written by a person of such repute as Mr. Parthasarthi is based on incorrect information, is factually wanting, and betrays a complete lack of knowledge about the project. All this when most of the information mentioned in this clarification has been in the public domain for a long time now, in materials available on the web-site of the National Mission on Education through ICT (www. Sakshat.ac.in). The writer could have simply checked the website or called up the Ministry to check the facts. Unfortunately, this was not done. At no stage before the publication of this piece was any clarification sought from this Ministry either by the writer or by The Hindu. It is hoped that in the interests of fairness, The Hindu will accord this clarification the importance it deserves, and publish it with the same prominence that was given to the article which has been contested. waiting for last four months. company has offered many date, still not received my device. DD allredy posted and it received to them. Now the company not responding my mails. the data wind is fraud company looted corers of rs from people by mailing them make advance payment for early delivery but all fraud govt should take action against the company and save the people who paid in advance for the Aakash Tablet. Don't you think Kapil Sibal should apologize to the nation and the World for lying to everyone? He is guilty of denying millions of children an opportunity to transform their lives. He is guilty of lying for 3 years, month after month. He has misled the nation and proved his gross incompetence in understanding any issue of public policy! May be he should sack the head of ICT Mission and that will be apology enough for now as long as he creates a mechanism that no public official should be allowed to mislead people of the nation and the world time and time again fro so long! If one needed a really unintelligent response to India’s most touted showcasing of an idea that had no legs, here it is. In response to Ashok Parthsarthy’s (a former Secretary of IT, Govt of India himself) piece on the bungling of Aakash project, MHRD decided to write a long note. Anyone making sense of the above note deserves accolades. That IITs DID NOT contribute anything technological to Aakash. That Aakash is NOT FOR Schools. It is ONLY for colleges. That of some 6440 pieces delivered, only 600 were supposed to have passed the test and most of them also did not measure up to scrutiny by third party examiners. Its a very sad commentary on India’s claims to make a cheap laptop and anyone with even a basic qualification from a rote learning school must hang his head in shame for India having fooled the world while depriving several generations of children an opportunity to learn with what has already been achieved by the human ingenuity by some of the finest minds in technology creation on the planet. Its a shame indeed that after 6 years of efforts to fool the nation and the world, MHRD’s ICT Mission for Education has failed to show a capability to even write specifications for a laptop or tablet that will be meaningful for education till date, despite asking all its IITs and other institutions that claim to have the capability to design an electronic gadget. As a Secretary to the Govt of India told me at the World IT Forum (of which I have been a Commission Chair for the past 7 years) : The invited guests have arrived at dinner but our kitechen is empty and the cook is nowhere to be seen! That is what Aakash can be best described as. Or as another senior officer said, MHRD has been pregnant with Sakshaat or Aakash for a bit too long! About time we declare a miscarriage and move on! akash tablet company is one of the fraud company in india, dail I have seen a lot of consumer complaints about that company. me also one of the register of the consumer complaints against akash tablet company. I have sent dd amount for them before 4 months, still I have not recieve my tablet still. they hv one phone no is 1800-180-2180 this no is not a valid no. if I get boring sometimes, I call this no and I use that no for my time pass. no one answer that no. It is clearly very uncertain when they keep on postponing the delivery of Ubislate. They are keeping on assuring the delivery which is not kept up. TL;DR – Akash is still unavailable despite the great press release we all saw.